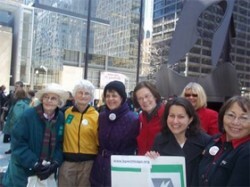 To celebrate National Equal Pay Day, the Chicago Commission on Human Relations joined 26 municipal, business, civic, trades, and professional organizations at a rally on Tuesday, April 17 at the Richard J. Daley Plaza. National Equal Pay Day symbolizes how far into the current year a woman must work to earn as much as a man doing similar work in the previous year. Though the federal Equal Pay Act was signed forty nine years ago, the average working woman earns just 77 cents to the average working man’s dollar. “Women represent nearly half of the American workforce and 51 percent of the population in Chicago, and are equally, if not totally responsible for the viability of their families,” said Mona Noriega, Commissioner, Chicago Commission on Human Relations. “We are proud to stand with hundreds of cities and thousands of people all over the United States to recognize that pay inequity impacts everyone.” For more information you may also visit the Chicago Commission on Human Relations at www.cityofchicago.org/humanrelations.